In 1937, animator and story man Joe Grant showed Walt Disney a drawing of his springer spaniel puppy named Lady. Intrigued by the drawing, Walt asked him to create a storyboard based on the dog. The original story involved the spaniel being replaced by a baby and a mother in-law with cats. Walt was unsatisfied with the story and the project was shelved. Years later, Walt read a story by Ward Greene called Happy Dan: The Cynical Dog that revived his interest in the project. Walt decided to add a cynical male dog into the previous story and the film began to take shape. Since this was the first time that a Disney animated film wasn't based on a popular book or fairy tale, Walt asked Ward Greene to write a novel that was released before the film, but it is actually the novel that is based on the Disney story, not the other way around (despite what the opening credits and original poster say). For the songs in Lady and the Tramp, Walt went to pop singer/songwriter Peggy Lee and her writing partner, Sonny Burke. The only song they didn't write was "Peace On Earth," which was written by Oliver Wallace, who wrote the score. As a result of Peggy Lee's work on the songs, she was cast as the voice for multiple characters. The character Peg was named after her, but she also voiced Si and Am the Siamese cats, Mrs. Darling and was the singing voice of Lady. Barbara Luddy provided the speaking voice for Lady and would go on to voice Meriwether in Sleeping Beauty and Kanga in Winnie the Pooh. Verna Felton voiced Aunt Sarah, who had also voiced the Queen of Hearts in Alice in Wonderland and the Fairy Godmother in Cinderella. 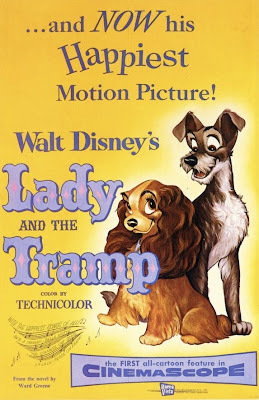 Lady and the Tramp was the first animated film ever made in CinemScope widescreen and was Disney's second film to utilize the ultra-wide format, the first being 20,000 Leagues Under the Sea. Since the camera and film were bigger, the paper the animators used and the backgrounds had to be bigger. This increased the cost of production and the length of time it took to animate. In addition, the animation was filmed twice, in CinemaScope and fullscreen for theaters that weren't yet equipped with CinemaScope. The animation alone took 3 years to complete. The film opens on Christmas Eve at the turn of the century. "Jim Dear" gives his wife, "Darling", a hatbox with a puppy inside, which they name Lady. Lady quickly grows up and when her owners begin to act differently, Lady assumes that she has done something wrong. It turns out that they are expecting a baby. As Jock and Trusty, the neighbor dogs, explain what a baby is to Lady, a stray dog named Tramp overhears and interrupts to explain that babies ruin homes for dogs. The baby is born and shortly after, Jim Dear and Darling go out of town, leaving Aunt Sarah in charge. She doesn't let Lady anywhere near the baby and when he two cats Si and Am make a mess, Lady is blamed. Aunt Sara tries to put Lady in a muzzle, but she runs away and Tramp saves her. He takes Lady to dinner at Tony's, where they are serenaded as romance blooms between them. The next day when Tramp turns his back, the dog catcher finds Lady and takes her to the pound, where she learns that Tramp is known for being a heartbreaker. When she is picked up, Aunt Sarah ties her to the dog house. Lady is chained up and is unable to catch a rat that gets into the babies room, so Tramp enters the house to fight it off. Aunt Sarah finds Tramp after he defeats the rat, but she doesn't realize what he did and calls the pound. To save Tramp from being put down, Jock and Trusty chase after the dog catcher's truck to free Tramp. Trusty is injured in the process, but they are successful and when Jim Dear and Darling find the rat and realize that Tramp saved their baby, they adopt him. The film ends at Christmas as the baby is playing with Lady and the Tramp's puppies. Lady and the Tramp premiered on June 16, 1955, in Chicago. Surprisingly, critics generally bashed the film. Their general gripe was that for an animated feature about dogs, the story was very mature and much more for adults. Some had complaints about the animation being "below par" for a Disney film, which is ridiculous because it is one of the most beautiful films the studio has ever made. Despite the lack of critical acclaim, the film was a big success. Audiences loved it and kept going to see it. It was re-released to theaters four times before making its VHS debut in 1987. I couldn't get enough of Lady and the Tramp as a kid. By the time I was old enough to watch it, Disney had taken it out of print. Luckily the neighbors had a copy and they let me borrow it several times. It truly is a pleasing film on all levels. The characters are wonderful and memorable. You will wish that they were your pets. The music is splendid and you're sure to have one of the songs stuck in your head after watching it, most likely "Bella Notte," which has become a staple Disney song. The story is charming and it tugs at your heart strings. To put it simply, Lady and the Tramp is everything that a Disney animated film should be. The animation and art direction are exquisite as well. Mary Blaire had already left the studio to pursue an independent career, so the art direction was primarily designed by Eyvind Earle, who would later achieve great success as an artist as well. Guests at Walt Disney World might notice a restaurant on Main Street at the Magic Kingdom called Tony's Town Square. The restaurant is themed to the film and is meant to be owned by Tony. If you look carefully outside, you will see pawprints in the concrete with a heart drawn around them from Lady and Tramp's first date. Lady and the Tramp is currently available on Blu-Ray as a Diamond Edition. The film has been fully restored in its original CinemaScope aspect ratio and comes with some great bonus features, including a making-of documentary, the original storyboards that Joe Grant made and a peak inside Walt's story meetings. A single-disc DVD is currently available, but it is very light on bonus features (only has an introduction and a game). It was previously released on DVD in a 2-disc Platinum Edition with lots of bonus features, so if you haven't upgraded to Blu-Ray yet, I recommend you track down the Platinum Edition. Most of the bonus features from this set are also included on the Blu-Ray disc. Disney also released a 3-disc combo pack that adds a digital copy. Walt Disney had been enjoying success with his series of short True-Life Adventures series since 1948. By this point, the series had already won six Academy Awards and critics and audiences couldn't get enough of this new medium that Walt Disney created, the nature documentary. For the second full length feature in the series, Walt drew attention to the prairies of Central America. Like all of the True-Life Adventure films, The Vanishing Prairie opens with a paintbrush. The introductory animated sequence teaches about the area and how the Native Americans understood the balance that was created by the animals. The film begins with Spring as geese, ducks and other birds return to the region after spending Winter in the South. As the grass returns to the area, the buffalo begin to procreate to ensure the survival of their species. Other animals of interest are big horned sheep, mountain lions, deer, prairie dogs, burrowing owls, rattle snakes, coyotes and falcons. The film is full of humorous and suspenseful interactions between the many inhabitants of the prairie. At the film's climax, a fire starts forces many animals to flee their homes. Then heavy rains cause a flood, causing the burrowing animals to move above ground. The film ends with the arrival of winter. 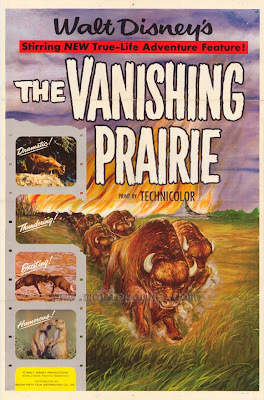 The Vanishing Prairie premiered on August 16, 1954, in New York City. As usual for the True-Life Adventures, critics and audiences adored the film. Like its predecessor, The Living Desert, The Vanishing Prairie was nominated for Best Documentary at that year's Academy Awards. It won, earning Walt Disney his seventh of eight Oscars for the series. Walt Disney's second True-Life Adventure feature is wonderful, just like the rest of the series. My family took a trip to the great plains, so the animals featured were no stranger to me, but the film was still interesting and entertaining. A remarkable fact about all of the True-Life Adventure films is that all of the audio is created by foley artists. It would have been too difficult to film and record audio for every shot. This is why music plays such a large role in these films. Once again, the only complaint that I can lodge at the film is that it uses some staged sequences, although less than The Living Desert. The most obvious stages scenes are during the fire, the flood, and in the prairie dog's tunnels. All of the True-Life Adventures were made available on DVD in 2006 through the Walt Disney Legacy Collection. They have all been fully restored and are accompanied by great features. The Vanishing Prairie is found on volume 2. Unfortunately, the DVDs are currently out of print. It is also available on iTunes in HD. Walt Disney's Rob Roy: The Highland Rogue was the fourth and final film made with the money Disney had made in the U.K. during the war which couldn't be exported. Richard Todd had starred in two of those films (The Story of Robin Hood and The Sword and the Rose). Glynis Johns played his love interest in the previous one and James Robertson Justice returns for his second Disney British film as well. In addition to the cast, much of the production crew were the same as the previous films, including producer Perce Pearce and matte artist Peter Ellenshaw. However, Ken Annakin was unable to return as director due to a contract dispute with another studio and Harold French took control of this film, the only one he did for Disney. Robert Roy MacGregor was a real person who lived in the late 17th and early 18th centuries. In real life, he defaulted on a loan when his cattle were stolen. His family was forced out of their homes and he waged a war against his creditors, eventually winning. Fictionalized tales about Rob Roy were written during his lifetime, characterizing him as a Scottish Robin Hood who lead a fight against King George. Sir Walter Scott later wrote a novel called Rob Roy based on those tales. When Ken Annakin was in charge of the film, it was going to be based on Scott's novel. When Harold French took over, he changed it to be closer tied to the original tales and real history. The film takes place in the early 18th century. The Scottish have been revolting against England's German King George for his heavy taxation policy, but most of the uprisings were crushed by the English army and eventually, only a few rebels were left. Rob Roy emerges as the leader of the rebels and is captured and taken to England to be hung. Rob's mother urges the Duke to send Rob to London for his trial with a plan for the rebels to free him during the journey. After his rescue, he marries Helen Mary and King George gives amnesty to all of the rebels, except for Rob Roy and his family. They arrest Rob, but on the journey back to London he escapes again. They steal his cattle and set his home on fire, which kills his mother. A London publication centered around Rob Roy is started and he becomes a hero amongst the people. Rob Roy travels to London to ask the King for amnesty for his men if he gives himself in. Instead, the King pardons Rob Roy. Rob Roy had its first public screening on October 26, 1953, as a Royal Command Film Performance in the U.K. However, the film didn't have its official premier until February 3, 1954, in New York City. Critics received it warmly, praising the film for its faithfulness to the tales. However, the complex plot confused audiences and the slow pace bored them. It was not a commercial success. It was the final Disney film released by RKO. Disney had already created the Buena Vista Distribution Company by the time this film was finished, but a distribution agreement with RKO was already in place before its existence. 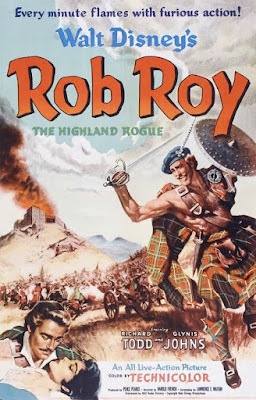 Rob Roy: The Highland Rogue had all of the necessary ingredients to be a great film, but it somehow fails to do so. To be fair, it has quite a few redeeming qualities. The acting is top notch and the sets and costumes are exquisite. The source material is intriguing as well. Where the film falls flat is the pacing. The film is plagued by frequent slow spots that become boring. It suffers from lengthy scenes of straight dialogue with little going on. In addition, the characters go through so much pain and have to fight so hard that the payoff feels small in comparison. The resolution is also handled so quickly that it feels rushed. It's definitely not a satisfying ending. Had Ken Annakin been able to stay on as director, it probably would have been as good as the other British Disney films. I wouldn't say it is bad, but it's not particularly good either. Rob Roy: The Highland Rogue is currently available on DVD as a Disney Movie Club Exclusive. It is also available on iTunes. In 1948, Walt Disney released the first in a series of nature documentaries called True-Life Adventures. Walt hired photographers around the world to shoot live footage of animals in their natural habitat and his filmmakers would edit them into films. Most of the True-Life Adventures were short subjects, but a few feature films resulted from the series, the first of which was The Living Desert. Walt Disney's nephew, Roy E. Disney, got his start in Hollywood as a producer on the True Life Adventures. He would later play a major role at the studio after Walt and his father Roy died. 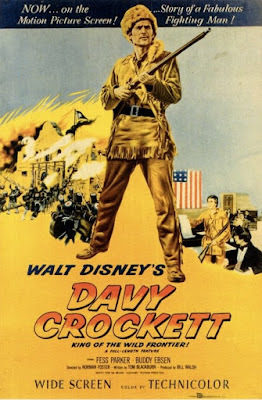 The Living Desert was the first Disney feature film distributed by Disney. Prior to this, Walt had mostly relied on RKO to distribute his films. But RKO had been reluctant about releasing the True-Life Adventures series and Walt was tired of trying to please a distributor. He and his brother Roy, who was in charge of the financial side of the company, created the Buena Vista Distribution Company, named after one of the streets that the Disney Studio was on. The film opens like all True-Life Adventure films. A paintbrush paints a globe to illustrate wind patterns, which turns into an animated sequence about how natural wind barriers, like mountains, create deserts. The film picks up with live action footage of Death Valley in North America. The phenomenon of moving boulders, mud bubbles, and sand storms are shown to highlight the miracle that creatures actually live in this wasteland. Among the animals featured are roadrunners, tortoises, bobcats, rattlesnakes, kangaroo rats, guila monsters and many insects, including tarantulas and scorpions. Many confrontations are shown between predator and prey, but the film never displays anything graphic or disturbing. The film ends with some beautiful time-lapse photography of desert flowers blooming. The Living Desert premiered on November 10th, 1953, and was a huge success. The film only cost $300,000 to make, but grossed $4 million at the box office. Critics mostly praised the film, but some had concerns over the way that Disney had edited jokes in, such as scorpions dancing a hoedown, which was done by simply switching the direction of the film repeatedly. At any rate, the Academy took notice of the film and gave it an Oscar for Best Documentary Feature. This was the sixth of eight Academy Awards that the True-Life Adventures won. Walt Disney has been credited with the creation of the nature documentary genre with his True-Life Adventures series. While this may not be true, I can't find anything to contradict that claim. As a nature documentary, The Living Desert is a fine film. The pace is great and it never gets tired. The U.S. government has even deemed the film historically and culturally relevant. Since 1953 many great nature documentaries have been made on the same subject and since camera technology has improved so much, more recent documentaries are able to provide a more thorough and real glimpse of desert life. The main fault of this film, and many other True-Life Adventures, is that many of the sequences were staged. Animals in captivity were shot on a set made to look like the desert and the desired action was forced. However, these scenes are still entertaining. What's really incredible about The Living Desert is the format, which nature documentaries are still using today. If you are a fan of nature documentaries, you are sure to enjoy this film. Disney recently got back into the business of making nature films. They co-funded the Planet Earth series and started up Disney Nature, a film division set to release a new film to theaters every Earth Day for the foreseeable future. All of the True-Life Adventures were made available on DVD in 2006 through the Walt Disney Legacy Collection. The Living Desert is featured on Volume 2: Lands of Exploration. All of the films have been fully restored and are accompanied by great bonus features. Unfortunately, the DVDs are now out of print. It is available on iTunes where it is available in HD. The Sword and the Rose was the third film made with the locked revenue from Disney films released in the U.K. during the war. 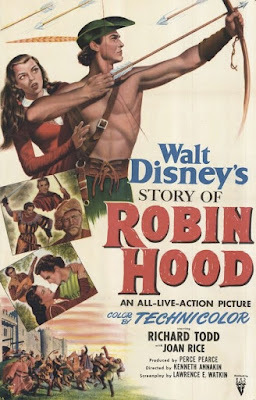 Many of the people responsible for making the film also worked on the previous British Disney film, The Story of Robin Hood and His Merrie Men, including director Ken Annakin, producer Perce Pearce, and star Richard Todd, who played Robin Hood. Glynis Johns was cast as Mary Tudor. The Sword and the Rose was based on a novel called When Knighthood Was in Flower by Charles Major and was the third film adaptation, but the first in color. The film takes place during the early reign of King Henry VIII. Henry is having Englishmen wrestle Frenchmen to find a suitable captain of the guard, which Mastor Charles Brandon wins. His first task is to deliver a message to the king's sister, princess Mary Tudor, who invites Charles to her ball. This sparks a fury in Duke Buckingham, who has been trying to woo Mary and sees Charles as a threat. Forbidden romance blooms between Mary and Charles as King Louis of France asks for Mary's hand in marriage. After a failed attempt to run away together to America, Charles is locked away and sentenced to death. To save Charles from the gallows, Mary agrees to mary King Louis with the agreement that after King Louis dies, she can marry whomever she chooses. Charles is tricked into attempting to escape, where he is stabbed and thrown into the Tames. Meanwhile, Mary is trying to bring about King Louis' death about sooner by making him do things he shouldn't, such as extensive drinking, dancing and horse back riding, which finally kills him. She calls for Charles to be sent to France and learns of his death. Duke Buckingham corners Mary, forcing her to marry him or the new king of France, but Charles is actually alive and has come to France to rescue Mary. A chase and battle ensues with Charles emerging as the victor. The two are quickly married as the film triumphantly ends on a happy note. 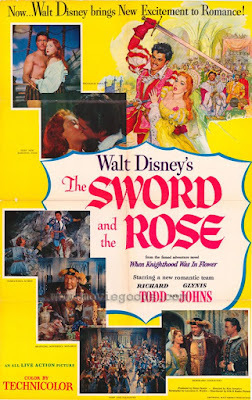 Walt Disney's The Sword and the Rose premiered on July 23, 1953. British critics bashed the film for being historically inaccurate. American critics didn't mind the liberties taken with historical facts, but didn't care much for the film itself. Audiences didn't flock to see it and it was not a success. It's a shame that The Sword and the Rose failed to find an audience in 1953 because it is a great film. While based on historical figures, it is primarily a work of fiction which might be why people have a hard time enjoying it. But if you can let go of preconceived notions about the real history of the Tudor era, you will find a delightful romantic adventure sure to win your favor. The characters are intriguing and the actors do a first rate job bringing them to life. The costumes and sets are exquisite and while lots of matte paintings were used, they are done so realistically that you hardly notice them. Peter Ellenshaw did the matte paintings for all of Disney's British films from this period before moving to America to work for the studio full time. He painted more than 60 matte paintings for this particular film. The Sword and the Rose plays like a fairy tale, although not one for children. While there aren't any objectionable scenes, the story is simply too boring for kids. It contains no magical elements and is focused more on the romance than anything else. The true audience for this film is adults with an interest in period romance. The film's title is a metaphor for the characters. The sword is Charles and the rose is Mary. It really is a great film and it's sad that so few people have seen it. The Sword and the Rose was released on DVD in December 2010 as a Disney Movie Club Exclusive. It is also available on iTunes. Although Walt Disney's Peter Pan wasn't released until 1953, Walt Disney had been trying to buy the right's to the original book by James M. Barrie since 1935, eighteen years earlier. His desire to adapt it possibly stems back to his own childhood when he played Peter in a school play. He got the rights in 1939 and his team of artists immediately started drawing up storyboards and character designs. They even got as far as making maquettes, clay models of characters for animation reference. These figures were seen by audiences in 1941 in Disney's The Reluctant Dragon. 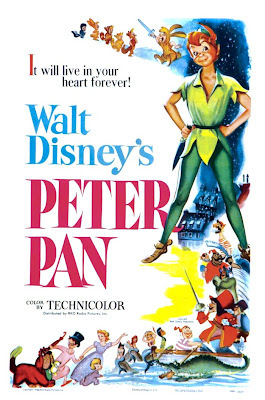 However, production on Peter Pan ended when the U.S. entered World War II. After the war, Walt was back to making full length animated features and among the first put into production was Peter Pan. For the voice cast, Walt relied heavily on actors he had previously worked with. Peter was voiced by Bobby Driscoll, star of Song of the South, So Dear to My Heart, and Treasure Island. This was his last film for Disney and the end of his contract. Wendy was voiced by Katharine Beaumont, who had previously voiced Alice in Alice in Wonderland. Screen star Hans Conried was cast in the double role of George Darling and Captain Hook, which is a nod to the original play in which the same actor played both roles. Conried went on to star in a few other Disney films as well. Peter Pan opens with an explanation that "All this has happened before and it will all happen again, but this time it happened in London." Wendy Darling has been telling stories about Peter Pan to her brothers, John and Michael, but when they get in trouble for reenacting the tale, Mr. Darling tells Wendy that this is her last night in the nursery and that she must grow up tomorrow. That night while the parents are out, Peter Pan comes to the house looking for his shadow, which he left while eaves dropping on one of Wendy's stories. Wendy finds him and helps sew it back on. In return, he teaches the Darlings how to fly and takes them to Nerveland with him where they never have to grow up. Peter's Pixie, Tinker Bell, flies ahead to tell the lost boys to shoot down Wendy, who she feels threatened by because another girl is now in Peter's life. Wendy is unharmed, but Peter banishes Tinker Bell for a week. Peter takes Wendy to the mermaid lagoon, where they find that Captain Hook has kidnapped Tiger Lilly, the indian chief's daughter, and is going to drown her if she doesn't tell him where Peter Pan's hideout is. Captain Hook seeks revenge on Peter for cutting off his hand and feeding it to the crocodile. Meanwhile, Michael, John and the lost boys have been kidnapped by the indians, who believe they have Tiger Lilly. Peter returns her safely and all is forgiven, but Captain Hook captures Tinker Bell and tricks her into telling him the location of Pan's hideout. Wendy and the boys are homesick and the lost boys decided to go home with them, but as they plan to leave they are kidnapped by the pirates and a trap is set to kill Peter Pan. He overcomes it, defeats the pirates, and sails the Darling children home in the pirate ship. Disney's version of Peter Pan was the first time that a male actor had ever played Peter on screen. The role was previously played exclusively by women. This was also the first time that Tinker Bell was more than just a ball of light, but had an actual physical form. The crocodile was in the original play, but was only heard, never seen. The animated medium allowed for the crocodile to have quite a bit of screen time. Another major change from the original story is that Disney shortened "Never Never Land" to simply "Neverland." But perhaps the most monumental changed that Disney made to the story is that in Disney's version, Peter doesn't ask the audience to clap their hands if they believe in fairies. The film premiered on February 5, 1953. Critics adored it because it stayed true to the original story while still being fresh and new. Audiences responded favorably to it as well and the film was a big success. It was re-released 5 times in theaters and was an event every time. The last release was in 1989, which is when I first saw Peter Pan. I was 4-years old and quickly became obsessed with it. It may be as a result of my childhood obsession that Peter Pan is my favorite film, but it has all of the quintessential elements that make a great Disney film. The characters are memorable and fun, even the villains. The story is adventurous and magical. In addition, it is everything that a Disney animated film should be, with some of the finest animation in any film. It was the last time that Mary Blaire would have a significant impact on a Disney film, but the design and color schemes are perfect. Peter Pan also features my favorite Disney song, "The Second Star to the Right." That song, along with "You Can Fly, You Can Fly, You Can Fly" and "Following the Leader" have become classic songs that are frequently found on Disney compilations. Peter Pan was released on Blu-Ray as a Diamond Edition in 2013 and went into the vault in 2014. Bonus features include a documentary on the children of the nine old men, deleted scenes and songs, behind-the-scenes featurettes, and Disney View, which adds artwork to the sides of the screen. The film is presented in its original fullscreen aspect ratio. The Diamond Edition DVD is a single-disc set, but the previous Platinum Edition was a 2-disc set and had much better bonus features, with a similar picture presentation. If DVD is your preferred format, I would recommend the out-of-print Platinum Edition. It is also available on iTunes, where it is available in HD and comes it iTunes Extras bonus features. Alice in Wonderland has an interesting history at The Walt Disney Studio. The studio actually owes much of its start to Lewis Carrol's inspiration. The first series of shorts that the Disney Studio did were called Alice Comedies, which placed a live action Alice in an animated setting. They ran from 1923 to 1927 and the first in the series was called "Alice's Wonderland." And when Walt had the idea of making an animated feature film, which eventually lead to Snow White and the Seven Dwarfs, one of his first ideas was to cast Mary Pickford as a live action Alice in an all animated world. He tried that idea again with Ginger Rogers in the lead. However, over the years Walt grew reluctant about making Alice in Wonderland. Walt's major problem was that the books lacked a linear plot. Alice goes to Wonderland, meets a lot of crazy characters, and then leaves. He also didn't find Alice to be a sympathetic character and felt that audiences wouldn't be able to relate to her. But his animation team was dying to make it. They had been begging him for years to do it and with feature animation back in full swing, he decided to let them have their chance at it. Production on the all-animated Disney version began in 1946. When audiences thought of Alice in Wonderland, they thought of the Tenniel illustrations found in the books. So the first attempt would use those drawings as the inspiration for the art direction. The entire film was storyboard and when Walt saw it, he knew it wasn't working. They discarded that version and began storyboarding another version that would be a comedy more than anything. What the film lacked in plot they were going to make up for with gags and music. To make the film as enjoyable as possible, Walt changed thing up by taking the best characters from both books, Alice's Adventures in Wonderland and Through the Looking Glass, and combining them into a single film. The Tenniel drawings were abandoned and a more Disney character design was chosen. Ed Wynn was cast as the Mad Hatter, the first time that a famous Hollywood actor was cast as a voice in a Disney film. To tie the film back to Lewis Carol as much as possible, most of the songs utilized poems from the books as lyrics. Over thirty songs were written, fourteen of which appear in the film, the largest number for any Disney animated feature. However, many of the songs are less than a minute long and are unmemorable. None of the songs became big hits, but a few of them are frequently found on Disney compilation albums, such as "The Unbirthday Song," "In a World of My Own," and "All in the Golden Afternoon." The score was nominated for an Academy Award, which can probably be attributed to the catchy "March of the Cards" sequence. While the film doesn't start with the opening of a storybook, the title sequence is reminiscent of illustrations in a children's book. Alice is bored during her history lesson, but when she sees a white rabbit with a coat and watch running by, she can't help but follow him. She falls down the rabbit hole and into Wonderland, where nothing is what it seems. In her quest to find the white rabbit, Alice has many unique adventures. She grows and shrinks several times, swims in a river of her own tears, joins a caucus race to get dry, hears a story from Tweedle-Dee and Tweedle-Dum, is smoked out of a house, sings with flowers, takes advice from a caterpillar, is taunted by the Cheshire Cat, attends a mad tea party with the Mad Hatter and March Hair and gets lost in Tulgey Wood. She gets in trouble with the Queen of Hearts when she helps the cards paint white roses red and is put on trial, during which many of the characters she encountered bear witness against her. In the end, she is chased down and just as she is about to be caught... she wakes up. It was all a dream. Alice in Wonderland premiered on July 26, 1951, in both London and New York City. Critics hated it, particularly British critics who were upset that Walt Disney had Americanized a British literary classic. Critics in the U.S. weren't kind to it either. The film was not a financial success in its initial release and just three years later, it was edited and shown on TV, the first Disney animated film to do so. However, in the 1970's the film became popular amongst college students, who would rent prints of it because of its "trippy" sequences. 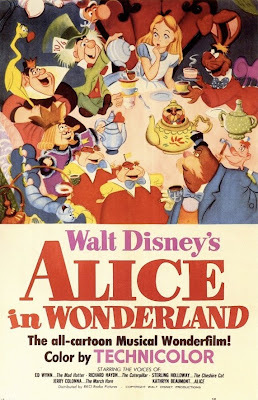 Similar to Fantasia, the Disney Studio noticed the trend and gave Alice in Wonderland its first theatrical re-release in 1974. The poster features bright psychedelic colors emitting from the caterpillar's pipe, which formed images of characters from the film. It did so well that it was released again 7 years later in 1981 and was one of the first Disney animated films released to VHS later that same year. Walt Disney's Alice in Wonderland had finally found an audience. I'm a big fan of Walt Disney's Alice in Wonderland. Like many people today, the Disney version was my first introduction to the story. I have never read Lewis Carol's original novels, but I've seen countless film versions that have remained faithful to the book and I have to say that I prefer the Disney version. What it lacks in plot it makes up for with fun and appealing characters. The animation is excellent and Mary Blaire's style dominates the film, making it visually appealing. Even though this film was not successful, it was used as the inspiration for one of the first Disneyland rides, the Mad Hatter's Tea Party, which can be found at all five Disney Resorts around the world. It was my favorite ride as a kid. Disneyland added a dark ride based on the attraction in 1958. In 2010, Disney released a live action version directed by Tim Burton that became Disney's most financially successful film of all time. Alice in Wonderland is available on Blu-Ray and DVD. The film has been fully restored and looks great. Bonus features include a retrospective documentary and the original One Hour in Wonderland TV special, Walt Disney's first television show ever. It is also available on iTunes in HD with bonus features. During World War II, many Disney films were released in the U.K. and made a good chunk of money there. However, the government wouldn't allow the money to be sent back to the U.S. and it had to be spent in the U.K. So after the war, Walt Disney had a lot of money that he couldn't use, so he decided to start making live action films there. His first choice was Robert Louis Stevenson's classic novel, Treasure Island. Walt had previously wanted to adapt it as an animated feature, but quickly decided that there was no need for it to be animated and waited until he was capable of making live action features. 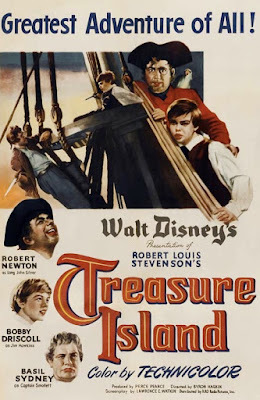 Treasure Island was the first Disney feature film without big animated sequences. For the role of Jim Hawkins, it made sense to cast Disney contract star Bobby Driscoll, the star of Song of the South and So Dear to My Heart. However, his work permit in England was for 3 months, so all of his scenes were shot first. British actor Robert Newton was cast as Long John Silver, a role he would reprise in a non-Disney sequel and a television series. Newton is credited with inventing the stereotyped pirate speech that is commonly used today. The rest of the film was cast with mostly unknown actors. An actual ship was used as the Hispaniola and filming aboard the ship was done at sea. This was the first color film adaption of the classic novel, but there were several black and white versions before it. The film starts with young Jim Hawkins taking care of his mother's inn. Pirates arrive to give William Bones, who is staying at the inn, the black spot indicating that they are coming to kill him. It turns out that they are after a treasure map that Bones has and before dying, he gives it to Jim. Jim shows the map to the Squire who decides to lead an expedition to the island to find the treasure and Jim is invited along as cabin boy. Jim takes a liking to Long John Silver, the ships one-legged cook, but when one of the crewmen falls overboard, Jim overhears some of the crew, including Long John Silver, talking about how they killed him. It turns out that most of the crew are pirates and Silver is their captain. Jim tells the Squire and the Captain about the pirate's plan to takeover the ship and get the map and chaos ensues as they go ashore. Jim becomes Silver's hostage. On the island, Jim escapes and finds Ben Gunn, a crazy old pirate who was marooned. The Captain and Squire meet up with Jim at an old fort on the island where a war ensues when the Captain refuses to hand over the map. Jim sneaks back to the ship to run it ashore so the pirates can't leave without them. When he is injured, Silver saves him and takes him to the Doctor. Silver strikes a deal to get rid of the rest of the pirates by leading them to the treasure site, which has been emptied. The Squire, Captain, and Doctor attack the pirates just as Ben arrives, who took the treasure to his cave. As they prepare to leave the island, Silver is set to be taken back to England for a trial, but he springs a gun on the crew and escapes with the treasure and a little help from Jim. Treasure Island premiered on June 22, 1950, in London. For the most part, critics were displeased with Disney's adaptaion, claiming that it made to many alterations to the story. However, it is considered one of the most faithful film adaptations to date and fans of Stevenson's work have said that the alterations were in the spirit of the original book. The film wasn't a financial failure, but it wasn't a big success either. It was later shown several times on TV. 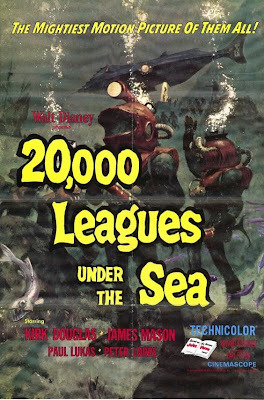 Disney re-released it theatrically in 1975, but the MPAA gave it a PG rating for violence, so the studio cut two scenes out and resubmitted it, earning a G rating. All of the VHS releases used the edited version. Treasure Island is a thoroughly enjoyable film. It is filled with great performances by all of the actors and the cinematography is excellent. While it wasn't nominated for any awards, many of the production team went on to win Oscars for later films. The story is exciting and for the 1950's, it is filled with a lot of action. Modern audiences might be shocked to see some blood in a Disney film and a scene in which Jim shoots a pirate in the face, but those scenes only add to the excitement of the film and help to further immerse you in the severity of the situation. This was not the only Disney film adaptation of Treasure Island. Disney produced a version in 1996 starring the Muppets called Muppet Treasure Island and Walt Disney Animation Studios adapted it as an animated feature set in space in 2002 called Treasure Planet. Pirates have played a big role in Disney film history, but Treasure Island was Disney's first pirate movie. Treasure Island is currently available on DVD in its full, unedited, original theatrical cut. It is also available on iTunes in HD. The war had crippled the Walt Disney Studio, which was now $4 million in debt. While a few of the films during the war had been financial successes, the majority of them lost money. Walt Disney needed a really big hit or the studio would close. He first started trying to adapt Cinderella in 1938, but it wasn't put into production until 1948, ten years later. Walt Disney's Cinderella begins like most Disney fairy tales with the opening of a book. When Cinderella's father dies, she is left with her stepmother and stepsisters, who force her to be their servant. Somehow, Cinderella has remained hopeful, optimistic and kind, making friends with mice and birds. Meanwhile, the king is worried that his son won't settle down and get married before he dies, so he plans a ball and every eligible lady in the kingdom is required to attend. When Cinderella finds out about the ball, her stepmother tells her she can only go if she can get all of her work done. Of course, she and the stepsisters pile so much work on her that she has no time to make a dress, so the mice help by making one for her. But when the sisters realize that the dress is made out of parts of their clothes, they tear it up and Cinderella runs into the garden crying. In her hour of despair, Cinderella's Fairy Godmother arrives and with a few magic words, gives Cinderella a beautiful gown with glass slippers, turns a pumpkin into a coach and all of her animal friends into horses to take her to the ball. However, the spell will ware off at midnight. At the ball, the Prince dances with Cinderella and they fall in love, but at the stroke of 12, she rushes out of the palace, losing a glass slipper. To find the mystery girl the Prince danced with, the Grand Duke takes the slipper to every house to find the girl it fits. When Lady Tremaine grows suspicious that Cinderella was the girl, she locks her in the tower. It is up to the mice to get the key and get past Lucifer the cat to free Cinderella. When Cinderella comes down the stars, Lady Tremaine breaks the glass slipper so she can't try it on. But Cinderella has the other glass slipper. The film ends with Cinderella and the Prince getting married and leaving in a carriage to enjoy their happily ever after. For the music in Cinderella, Walt Disney looked to popular song writers instead of his typical staff writers. Many songs from previous Disney films turned into big hits and in turn, they had a positive effect on the success of those films. Walt needed Cinderella to be successful, so he made sure that the songs would be popular and it worked. 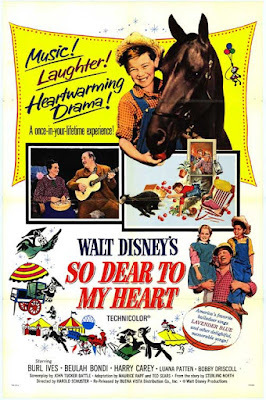 "A Dream Is a Wish Your Heart Makes" was a huge hit and has stood the test of time, becoming a secondary Disney anthem to "When You Wish Upon a Star." The score was nominated for an Academy Award, and "Bibbidi-Bobbidi-Boo" was nominated for best song. "The Work Song," performed by the mice, became a radio hit in addition to "A Dream Is a Wish" and "Bibbidi-Bobbidi-Boo." Of the six songs from the film, four of them are commonly featured on Disney compilation albums. In anticipation of the music being popular, Walt started the Walt Disney Publishing Company and published the songs himself, rather than going through a distributor. The soundtrack was the number 1 seller for a solid year. The voice cast is marvelous. Ilene Woods knew the songwriters and they used her in their demo recordings to present to Walt. It was not their intention to have her cast as Cinderella, but Walt was so taken with her voice that he hired her based on those demos. Verna Felton, who voiced the Fairy Godmother, had previously voiced one of the mean elephants in Dumbo. The narrator of the film is Betty Lou Gerson, who would later voice Cruela DeVil in 101 Dalmatians. Elanor Audley voiced Lady Tremaine and would later voice Maleficent in Sleeping Beauty as well as Madam Leota in the classic Disney park attraction, The Haunted Mansion. The animation is some of the best that Disney has ever done, even to this day. The transformation scene where Cinderella's rags turn into a beautiful ball gown was Walt Disney's favorite piece of animation that his studio had ever done. Compared to the previous package films, the film feels like it could have been made ten years later in terms of how advanced the animation is. Much of the style of the film was created by Mary Blaire. Her artistic sensibilities shine in this film. A keen eye might spot a few hidden Mickey's in the film as well. One during "Sing Sweet Nightingale" and two on Cinderella's coach at the end of the film. 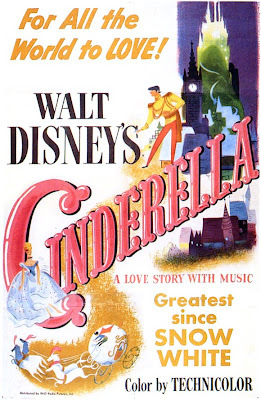 Cinderella premiered on February 15, 1950, in Boston. The importance of Cinderella to the Walt Disney Company can't be understated. It was a ginormous success, the first big success since Snow White and the Seven Dwarfs. And in addition to the box office revenue, Disney made a ton of money off of merchandise and music sales. Critics were unanimous in their praise for the film. It seemed as if everybody who saw it fell in love with it. But the really important thing was that Walt Disney finally had money again so that he could make the films he wanted to make. The film enjoyed success throughout the years with numerous theatrical re-releases. Walt Disney's Cinderella is my third favorite Disney film. The film has a lot going for it. The animation is superb, the music is wonderful, and the characters are appealing. It is impossible to not root for Cinderella to succeed. I'm a big fan of Mary Blaire and this film is full of her style, particularly in the design of the castle and the bright color scheme. Cinderella is currently available on Diamond Edition Blu-Ray. This edition boasts a marvelous restoration, faithfully representing Mary Blaire's bright colors for the first time since its original release, and bonus features, including a making of feature. It is also available as a single-disc DVD that loses a lot of bonus features, but if you can get an affordable copy of the out-of-print Platinum Edition, you will get more bonus features with a similar film transfer. It is also available on iTunes in HD and with bonus features. Prior to World War II, Walt Disney had been planning to adapt many classic stories into feature animated films. Two literary classics he was considering adapting as animated features were The Wind in the Willows by Kennith Graham and The Legend of Sleepy Hollow by Washington Irving. After the war, and years of development on both projects, it was determined that the stories were better suited as 30 minute shorts rather than 70 minute features. And since it was easier to sell long shorts as package features, Walt Disney decided to combine the shorts into one film. The original title was Two Fabulous Characters, which was changed to The Adventures of Ichabod and Mr. Toad. The film opens on a private library as a copy of The Wind in the Willows flies off the shelf and opens up. Basil Rathbone narrates the story as the illustrated pages come to life. Rat and Mole are summoned to Toad Hall by Badger because Toad is always out with his horse, Cyril. While out, Toad sees a motor car and becomes obsessed. Toad is arrested for supposedly stealing a car. During the trial, it turns out that Toad traded Toad Hall to the weasels for the car, but when Mr. Winky testifies, he says that Toad stole the car and he is thrown in jail. On Christmas, Toad breaks free. With the help of Rat, Mole and Badger, they sneak into Toad Hall to get the deed back from Winky and the weasels. They get Toad Hall back, but Mr. Toad is quickly onto a new obsession, air planes. Back in the library, The Legend of Sleepy Hallow opens and Bing Crosby narrates the story. The oblong Ichabod Crane has just moved to Sleepy Hallow to be the schoolmaster. He meets Katrina and falls head over heels for her. This causes a feud between him and Brom Bones, Sleepy Hallow's resident he-man. At Katrina's Halloween party, Brom Bones tells the legend of the headless horseman to scare Ichabod. On Ichabod's ride home that night, the headless horseman appears and chases him down. The next morning, Ichabod's hat is found next to a smashed pumpkin, but he is never seen again. 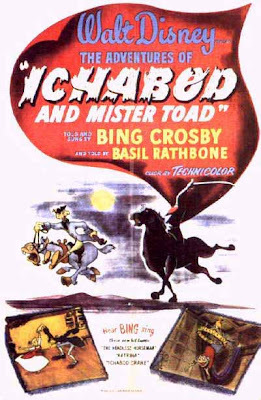 The Adventures of Ichabod and Mr. Toad was released on October 5, 1949 without a formal premier. Critics were generally pleased with the film, despite their distaste of the package feature concept, and the film enjoyed moderate success at the box office. It was the last package feature at the studio since Walt finally had the resources to resume animated feature production. Cinderella was already in production while Ichabod and Mr. Toad was being completed. Of the six package features made by Disney, The Adventures of Ichabod and Mr. Toad is the most enjoyable. Both sequences are very well done and even the animation quality is better, although it's still not feature quality. The music is better as well. "Nowhere in Particular" from Mr. Toad's sequence is sure to get stuck in your head. And the Bing Crosby songs in Ichabod's portion are great. However, Disney has had so many great and memorable songs that the music from this film has pretty much faded into obscurity. This film was never re-released to theaters in its entirety. Instead, the two segments were split up and released individually in the 1950's with some minor editing. They were shown on TV countless times and both were released on VHS separately, but the full film wasn't seen again until it was released on laserdisc in 1990 and on VHS in 1999. A popular Disneyland ride is based on The Wind in the Willows portion of the film called Mr. Toad's Wild Ride. The attraction used to also be at Walt Disney World, but was removed in 1998. The Magic Kingdom also features a funnel cake shop in Liberty Square called Sleepy Hallow Refreshments that is a not to The Legend of Sleepy Hallow and their Halloween parade is kicked off by the Headless Horseman. The entire feature is currently available on DVD, but it would be nice if Disney gave it a better restoration and re-released it on disc. A new restoration has been done and that version is available on iTunes in HD. In addition, The Wind in the Willows is available separately as part of the 'Walt Disney Animation Collection' where it is paired with other Disney shorts. 'Melody Time' was most likely put into production before 'Make Mine Music' was released. Another package feature, 'Melody Time' was Walt Disney's second attempt at a contemporary 'Fantasia.' The first missed its mark by trying to combine slapstick musical shorts with artistic pieces, causing that film to have a very erratic flow. 'Melody Time' corrects that error by sticking to the more humorous and slapstick style of musical shorts, with only one serious and artistic piece. Once again, popular music artists from the 40's lend their talent to each of the seven shorts, giving the film some star power beyond the Disney name. 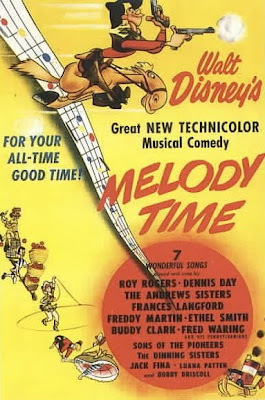 The film begins with the opening of a book of sheet music as Buddy Clark sings a song called "Melody Time." The first sequence is "Once Upon a Wintertime" sung by Frances Langford. A human couple goes ice skating as a pair of bunnies mimic their actions. When the couple gets in a fight, the girl goes stomping off and doesn't realize that she has entered thin ice. The ice breaks apart and the guy must come to her rescue. Next Freddy Martin's orchestra plays "Bumble Boogie," a jazzy version of "Flight of the Bumble Bee." As the song plays, a bee flies around trying to escape plants made of musical instruments that try to get him. In the third segment, Dennis Day sings and speaks for Johnny Appleseed and his angel in "Johnny Appleseed." Johnny feels that his job of picking apples is useless compared to the pioneers that were settling the West. His guardian angel convinces him to head West, planting apple seeds across the country for the settlers. The short ends with a gray haired Johnny heading to heaven with his angel to plant apple trees in heaven. The fourth segment is "Little Toot," sung by The Andrews Sisters, who did a segment in 'Make Mine Music' as well. This sequence is reminiscent of "Pedro" from 'Saludos Amigos.' Little Toot is a young harbor tugboat who disrupts the bigger tugboats and causes a big ocean liner to crash. Little Toot is put out of service and banished from the harbor. While out at sea during a storm, he sees a distress signal from a big ship. He sends out an S.O.S., but the rest of the tugboats are unable to make it. It's up to Little Toot to tow the ship to safety. He is forgiven since he has learned his lesson and gained responsibility. The fifth segment is "Trees" by Fred Waring and his Pensylvanians singing the classic poem. This is the one artistic and serious sequence of the film. "Blame It on the Samba" by Ethel Smith and the Dining Sisters is a continuation of the South American package features, 'Saludos Amigos' and 'The Three Caballeros.' It was created for the third feature, which was never produced. It features Donald Duck and Jose Carioca unenthusiastically entering the Cafe de Samba, which is run by the hilarious Arucuan. The rhythm of the samba revives their spirit. A live action lady playing is blended in with the animation, making it feel even more like an extension of Caballeros. The sequence is just as "trippy" as that film as well. The final segment features Roy Rogers and the Sons of the Pioneers singing the story of "Pecos Bill." The singing stars are sitting around a campfire with Bobby Driscoll and Luana Patten, the stars of 'Song of the South.' Roy Rogers tells them the story of Pecos Bill and why coyotes howl at the moon as it transitions into animation. Bill was raised by coyotes and rescued a horse as a boy, who become his closest companion in all of his tall tale adventures. As an adult, he met and fell in love with Slue Foot Sue, causing a riff between him and his horse, Widowmaker. Sue wanted to be married in a big bustle and riding Widowmaker. The horse bucked her off and as she landed, her bustle sprung her higher and higher each time. Bill tried to wrangle her down, but his efforts were thwarted by Widowmaker and she bounced until she landed on the moon. Bill moved back with the coyotes and howled at the moon every night to let Sue heard him. The coyotes would join in out of sympathy and have continued to howl at the moon ever since. 'Melody Time' premiered on May 27, 1948. It did fine at the box office, but was by no means a big success. The individual segments of 'Melody Time' are well done, but the true gems are "Once Upon A Wintertime," "Johnny Appleseed," and "Pecos Bill." The animation quality is mostly comparable to the shorts, but there are a few instances of feature quality animation, particularly in "Trees." Many of the segments showcase a lot of the Mary Blaire style that I am so fond, which adds to its appeal for me. The film was never re-released in theaters, but most of the sequences were reissued individually. 'Melody Time' is currently available on DVD, but the movie has been censored. Instances of smoking have been digitally removed from "Pecos Bill" and a few scenes were fully cut from that sequence as well. Ironically, Disney didn't object to the massive amount of guns in this sequence, which was their reason for cutting "The Martins and the Coys" from 'Make Mine Music.' But the censorship won't distract you from enjoying the film and if you have never seen the short in its uncensored form, you would never know it had been altered.